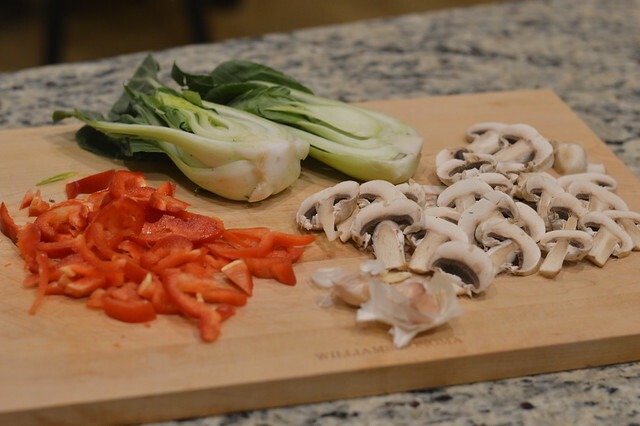 Always looking to incorporate unique and healthy meals into my weekly dinner rotation, I was anxious to try this tofu stir fry. Adapted from a recipe I had seem on The Minimalist Baker, I was especially excited to try a baked tofu dish, as I am used to pan frying my tofu, and truth be told I have never really been successful at making tofu. I never quite cook it right, it seems, and the texture is always such a let down. 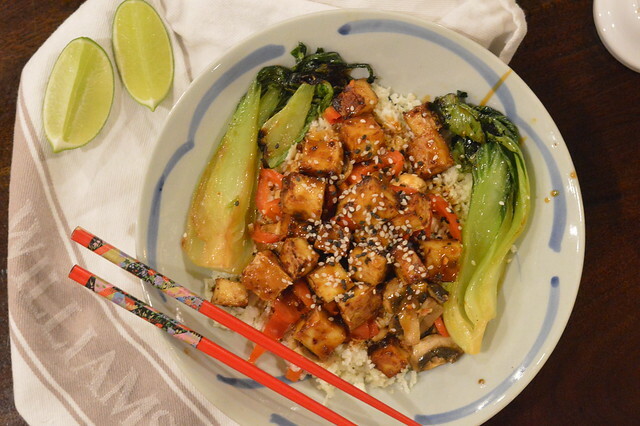 Thanks to the way the tofu is prepared in this dish, I am so happy to share this recipe! I will always cook tofu this way and I absolutely loved this dish. Cauliflower rice is super simple so don’t be intimidated! You must try it. It looks and tastes like rice and tastes even better as it absorbs sauces perfectly and takes less time to cook. Plus it’s healthy! I modified the recipe a little, and I added what I call my “clean out the kitchen” veggies, aka whatever is in our fridge at the time. Begin by draining tofu 1.5 hours before you want your meal ready. 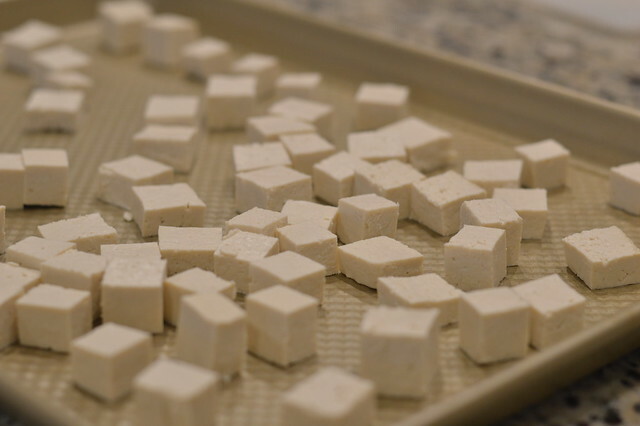 If your block of tofu is larger than 12 ounces, trim it down. You don’t need a full pound for this recipe (see notes). Roll tofu in an absorbent towel several times and then place something heavy on top to press. I use a pot on top of a cutting board and sometimes add something to the pot to add more weight. Do this for 15 minutes. Near the end of draining, preheat oven to 400 degrees F (204 C) and cube tofu. Place on a parchment-lined baking sheet and arrange in a single layer. Bake for 25 minutes to dry/firm the tofu. Once baked, remove from oven and let cool. Prepare sauce by whisking together ingredients until combined. Taste and adjust flavor as needed. I often add a little more sweetener and peanut butter. 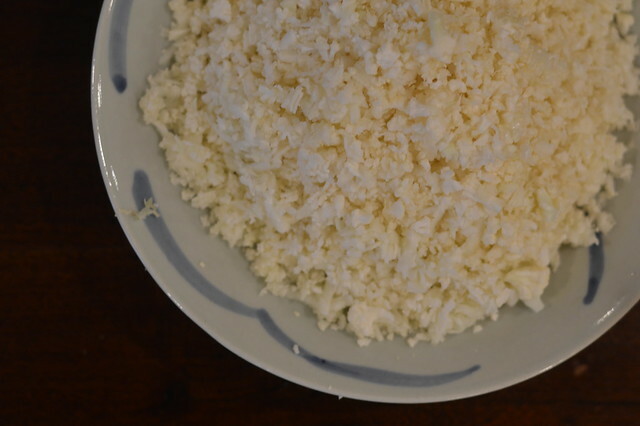 In the meantime, shred your cauliflower into rice by using a large grater or food processor. You don’t want it too fine, just somewhat close to the texture of rice. Set aside. Mince garlic if you haven’t already done so, and prepare any veggies you want to add to the dish (optional). Use a slotted spoon to spoon tofu into the preheated pan. Add a few spoonfuls of the sauce to coat. Cook, stirring frequently for a few minutes until browned. It will stick to the pan a bit, so don’t worry. Remove from pan and set aside and cover to keep warm. Add a drizzle of sesame oil to the pan, then add garlic and cauliflower rice and stir. Put cover on to steam the “rice.” Cook for about 5-8 minutes until slightly browned and tender, stirring occasionally. Then add a few spoonfuls of sauce to season and stir. Place cauliflower rice and top with veggies and tofu. Serve with any leftover sauce.